Some quilters have done their stitching by hand for a number of years before making the switch to a sewing machine. Others may just be starting to learn to quilt. Your quilting skills and how you plan to use them will determine which quilting sewing machine features will be most important to you. Once you know your options, you can start to look for the perfect machine for your quilting needs. "What is the best sewing machine for quilting?” is a common question asked by sewers. The answer depends on the specific needs of the person who will be doing the quilting. The choices run from basic machines for beginners with a few stitches to computerized machines that have an endless array of stitching designs to choose from. Some quilting machine reviews focus on machines with the most advanced features while others are more concerned with durability. If you're looking for the best quilting machine, the Singer 7258 Stylist is an award-winning machine and the Janome 7700QCP is an updated version of a legendary quilting machine. You can't go wrong with either one. Some of the most important features for quilting are a good quality straight stitch, an adjustable zig zag stitch for applique, and a needle up/down feature that lets you choose when and where to stop at the touch of a button. 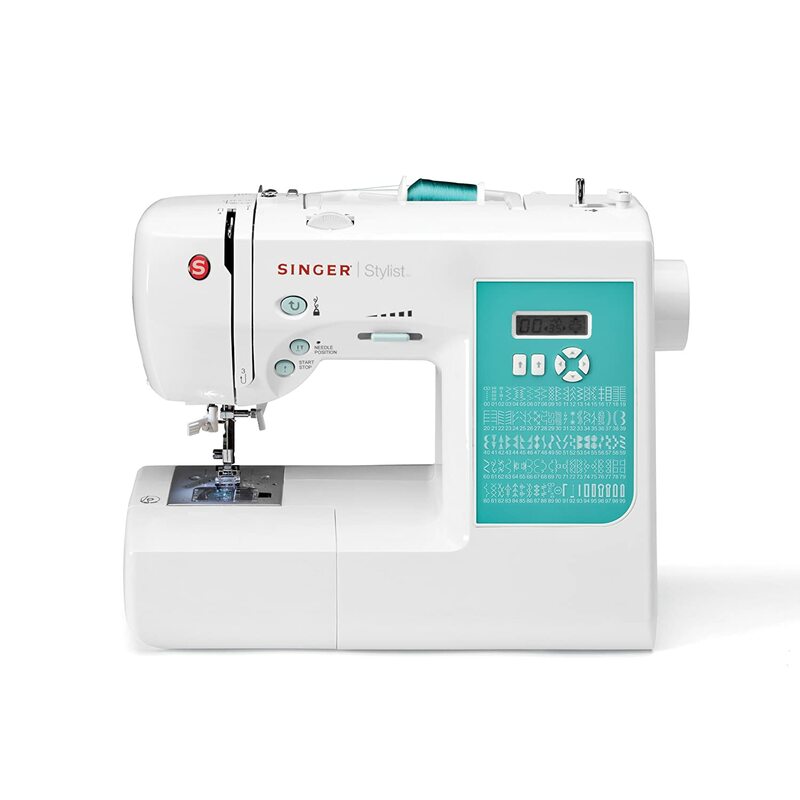 Based on these basic needs and the additional features needed by some sewing levels, this review compares the Brother CS6000i, Singer 7258 Stylist, and the Janome 7700QCP. The Brother CS6000i is an affordable machine that is user-friendly and portable. For anyone who is taking a quilting class, the built-in handle makes it easy to take along. This feature combines with lightweight construction to make it the best quilting sewing machine for portability. It comes with 9 presser feet for a variety of stitch types and a detachable, oversized table to give you the extra space you need for larger projects. The automatic needle threader makes it easy on the eyes. There is also an upper and lower automated thread cutting feature and the built-in memory lets you store your favorite stitches and access them quickly with the LED display. Adjust the brightness of the screen for the setting that is most comfortable to you. The Brother name also makes this a top choice for reliability. The Singer Stylist™ is an award-winning machine that has received the Consumer’s Digest award twice. This award is given to machines based on 8 criteria: ease of use, performance, quality of construction, features, warranty, styling, efficiency, and maintenance and service requirements. It has a number of features that make it a good choice for quilting. Simple push-button stitch selection lets you choose the stitch you want to use with the push of a button. With 100 built-in stitches, you can perform a wide variety of sewing styles including quilting, heirloom, crafts, and fashion. The automatic needle threader takes the hassle out of changing thread while the programmable needle up/down makes it easier to quilt and applique by selecting where the machine will stop with the needle in the up or down position. The start/stop button gives you the option to sew without the use of a foot controller. Speed control allows you to control the speed of sewing without the foot controller. If you like a feature-rich machine that is also easy-to-use, the Janome 7700QCP is the best quilting sewing machine for you. It has a long list of features that include an extra high presser foot lift, adjustable knee lifter, built-in one-hand needle threader, flat bed convertible and 11” x 4.7” of work space. With 250 built-in stitches, there is no limit to the design possibilities. 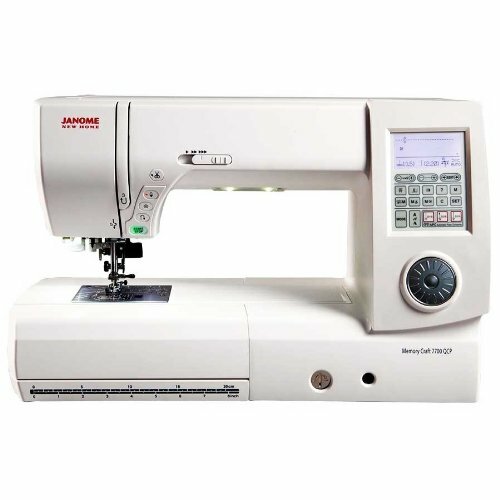 This machine is an updated version of the Janome Memory Craft 6600 which many people consider one of the best sewing machines for quilting ever made! One thing that makes this such a great machine is that the updates were based on customer feedback. Today, the Janome 7700QCP offers sewers and quilters a machine with all of the original features of the Memory Craft 6600 and a lot more. There is no end of quilting machine reviews providing an individual choice in the single best quilting sewing machine. This review compares a selection of the best sewing machines based on a variety of criteria. If you know what you want in a sewing quilting machine and how much you can afford to pay, you should be able to use the information here to answer the question “What is the best sewing machine for quilting?” that is right for you. Straight-line quilting is just like it sounds. It is sewing pieces together with a straight stitch. Free-motion quilting is more artistic. You move the quilt around to create artistic stitch designs such as meandering and stippling. People are typically as passionate about their choice in one of these quilting methods as they are about quilting by hand or machine. Your preference will come into play when you consider some of the features available on modern quilting machines. Extension Table – An extension table gives you more working space in comparison to a traditional sewing machine. This feature makes it easier to handle large projects like quilts. Exceptional Lighting – If you want to make the most of your work space and your other features, you have to be able to see what you’re doing. Make sure you find a machine that lights up the entire work space. Large Throat/Harp – The opening in the machine between the needle may be called the harp or throat. It includes the horizontal and vertical space that allows you to push the quilt through as you are sewing it. When comparing machines, take note of the throat space in addition to any other features. If you will be working on large-sized quilts, you will need adequate space to manage their size. For example, think about stitching the center of a king sized quilt. The entire right half will need to fit into the throat of the machine in order to access the area you are sewing. Extra-High Presser Foot – A good quilting sewing machine will have an adjustable presser foot that accommodates thick and multiple layers of fabrics without forcing the fabric through. Adjustable Feed Dogs – The debate of whether to drop the feed dogs when free-motion quilting rages on. Dropping the feed dogs is taught as a standard rule for free-motion quilters but many find that the issues it causes with tension result in ugly stitching. If you plan to try free-motion quilting for the first time on a new machine, you may want to have this option. Then, you can try it both ways to see which side of the argument you are on. Automatic Needle Threader – Let the machine do the work of threading the needle. An automatic needle threader is the biggest timesaver in sewing! Needle Up/Down Function – This feature will keep your quilt in place when you stop sewing so there is no slipping under the needle. Large LED Display Screen – Today’s basic quilting sewing machine is computerized with an LED display screen to make setting your stitches easy. Make sure yours is easy-to-see and use so you always know the stitch you are selecting and what the machine is currently doing. Knee Lifter – This feature allows you to control the presser foot while keeping both hands on your quilt. Assortment of Quilting Feet – You will need a ¼” presser foot for straight-line seams, a walking foot to help feed the fabric evenly, and a free-motion or darning foot for free-motion quilting. Check to make sure that these are included with the machine. At the same time, find out how easy it is to change out the presser feet. Those that snap on and off are easier and faster to change. Easy Threading System – Nothing slows you down more than a machine that is difficult to thread. For many sewers, this is the feature that makes or breaks a good machine. Generous Accessory Kit – This should include a variety of presser feet for quilting and basic sewing. The more accessories that come with the machine, the less you have to worry about adding to your collection to get started. Affordability – Growing technology has resulted in a number of high-end sewing machines that are meant to make sewing and quilting effortless and a lot more versatile. As a result, the machines on the market are offered in a broad range of prices from just over a hundred dollars to several thousand. If you plan to use your machine in a professional capacity, you will want to invest more in a machine that meets your demands for versatility and durability. If you are just starting out or just enjoy quilting as a hobby, you don’t have to spend a lot to get a good quality machine. There are many affordable models that provide professional-quality results. The most important feature of any quilting sewing machine is going to be the quality of stitches it produces. The best way to make sure you are getting a good quality machine is to stick with top brand names like Janome, Brother, and Singer and look at customer reviews before you make your choice. Nothing is more helpful than other people’s experiences to determine what works and what doesn’t.